In the past decade, local force measurement techniques such as atomic force microscopy and optical tweezers were used to study elastic properties and mechanically induced structural transitions of nucleic acids at the single molecule level. Single molecule manipulation was also increasingly used for investigations of DNA-dependent enzymatic processes, related to unfolding and modifying DNA, protein-DNA interactions, replication and transcription. Compared to classical techniques of molecular biology, single molecule measurements avoid the averaging over a large number of events and can thus potentially provide detailed and complementary information. The nucleic acids DNA and RNA play a central role in biology and the understanding of nucleic acid related molecular processes is steadily growing. 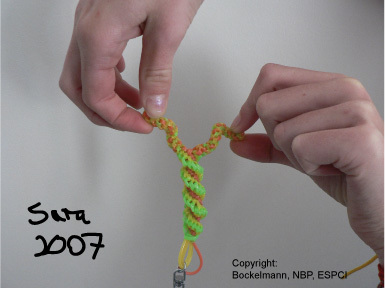 X-ray scattering, electron microscopy and nuclear magnetic resonance techniques are very important in this field, as they provide high resolution structures of RNA and of protein-nucleic acid complexes. This structural information has to be complemented by dynamic studies to reveal the conformations, energy landscapes, length and timescales of molecular rearrangements involved in the function of the macromolecule. Single molecule manipulation of nucleic acids allows to apply an external mechanical constraint (force and/or torque) in a well defined way and to measure the time-dependent response in length, force, angle or torque. These measurements are usually done in solution and can provide access to the folding dynamics and the elastic properties of nucleic acids. Forces that are generated in the course of biochemical reactions can be measured and the reaction can be investigated as a function of an external mechanical load. We use optical tweezers to perform single molecule force measurements on DNA and RNA and two investigate DNA and RNA-dependent enzymatic processes.